A wise man once told me that music is like when going to a buffet. You don't just eat the bread rolls- you gorge on the whole lot and try some of everything. That wise man was Dilip Parekh- the acoustic guitar wielding lead singer of Fremantle based reggae band 'Dilip n' the Davs'. The Davs are a seven piece band made up of a variety of talented musicians. With Andrew 'Blew Drew' Pring on melodics and harmonies, Edo Ekic on lead electric guitar, Jonathan Brittain on trombone, Marie O'Dwyer on keys and harmony vocals, Bob Ferrari on bass and Rowan Parekh on drums and percussion the bands lineup is incredibly impressive. I first saw the Davs at my favourite place in the world- Fairbridge Festival and they really impressed me with their live performance. There's so much potential for things to go wrong when you're live- especially with seven players and no click track- but these guys nailed it- and I'm pleased to say they backed it up in the studio. 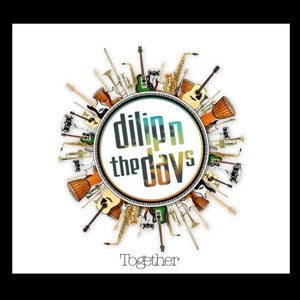 'Dilip n' the Davs' album 'Together' is brand new, and absolutely wonderful. As you guys know- I love Aussie bands and I get especially excited when the bands have lyrics that show their love for Australia, and the Davs must have known I was coming, because they are absolutely all over it which made me very happy. :) Now I'm not a huge fan of reggae in general- but I'll listen to anything once and you should too because this is a damn good album. The songs are all quite lengthy for the most part but you don’t even feel it, and the album goes past altogether too fast. Time flies when you’re having fun! The record opens on 'Thick or Thin'. It launches you straight into the world of the Davs mellow brand of reggae and really sets up the entire album. The horn parts are fantastic- really great especially the trombone solo towards the end. It's the perfect track to make you super excited for the rest of the album. Next up is 'Nine Days'- a really great track which I enjoyed a lot. It's super upbeat and I feel like a lot of FIFO workers would probably be able to relate to this song a lot. Again, it opens with a cracking horn line, Jonathan has done an amazing job at arranging these parts- if you ever want another sax player- you guys should call me! Standing out for me are the vocal tracks. Honestly, they're really great and I can't get over how well Dilip and Marie's voices blend together so well! It makes the entire album super enjoyable because it just works. Dilip has a super unexpectedly smooth voice that I just really dig. Also take note of the cool airport voiceover and also the crazy breakdown! 'Reggae Gone' is my favourite track on the album, it's a really great upbeat song with some really good lyrics. I love the mentions of different places the band obviously likes to frequent, including an Isolated Nation favourite Mojos! I love how they've teamed together different layers and speeds between the verses and chorus. Goes from really slow to very fast and it keeps you guessing and interested. None of the songs are the same, there's always something happening which makes it a really good album. 'Nannup' is written about Nannup Festival and slows things down a little more to that traditional super chilled out reggae feel we all love. Oh- and there’s some SWEET percussion at the opening of this track, as well as an excellent trombone line throughout the songs entirety. Occasionally The Davs have used some freaky effects on the vocals, just a super whacked out delay. It really works and totally adds to the atmospheric feel of this chilled, laid back track. ‘Like a King’ is also a very slow and relaxed song. The chorus is slow and haunting, and is one that gets stuck in my head a lot due to the simplicity and effectiveness of it. Accompanied by some great guitar sounds, this track is basically a vocal showcase, showing how versatile Marie and Dilip really are. Next up is the longest track on the album- ‘Look What Happened’. It’s nearly 8 minutes long, which to be honest for reggae is usually the standard. It’s punctuated regularly by the trippy vocals of Dilip maxed out on effects and some smashing horn lines. (Can you tell I adore horn sections??). What’s really great about this track are all the crazy sounds and the way everyone gets a small section to show off their talents, if you will. There’s entire sections which are completely free of vocals which can be a little risky, but in this case really works and just adds to the vibe of the track. 'Mollie' is up next and the only criticism I have is for the vocals in this song- they're not bad at all, don't get me wrong. I just feel like they sound American? It almost sounds like they're singing about 'Marley' which I thought was perfect and hilarious because obviously of 'Bob Marley' and I thought that was great. But it's actually 'Mollie'. That's the only issue I have and even that is just being picky, and now I feel like a terrible person. This song is happy and joyful sounding with a wonderful feel and is the Davs tribute to a new addition to their reggae world. It’s reminiscent of ‘The Little Mermaid’ with that really happy gorgeous sound. It’s a dance-around-your-room kind of a track. Winding down the album we have ‘Too Funky’ a very horn driven track, which of course I loved!! I love the vocal style of this track, it’s hard to explain but it’s really cool and, well, funky!! It’s super easy to get into and sing along too which is great. The penultimate track is ‘Yokohama Girl’ and once again we have picked up that fast upbeat pace the Davs shine in. I love the back up vocals on the chorus, they sound super sweet and they really compliment the lead vocal. Wonderful songwriting! 'Lookin' At Ya' is the last track on the album and I think it's worth mentioning that this song was actually picked up by Qantas as a song that will be included as part of the 'Global Beats Music Channel' in-flight entertainment. It's really wonderful that an unsigned, indy Freo Band managed to get a track onto this channel. Well done guys! In true Davs form it’s of course a great track. Can’t wait to hear it on my next flight! Now. To find somewhere to go….. Thanks for listening to my wafflings once again, you guys rock! Check us out on Twitter: @isolatednation and @perthsoundchic will keep you happy, and we’d love to know what you think!